Former army boss Constantino Chiwenga has been appointed VP. File photo. 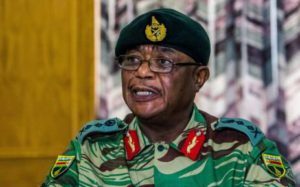 HARARE – Zimbabwean President Emmerson Mnangagwa appointed retired army boss Constantino Chiwenga and veteran politician Kembo Mohadi as the ruling party’s vice presidents, a spokesperson said on Saturday. The appointments paved the way for the two to ascend to similar positions in government, officials said. Mnangagwa, who took over last month from 93-year-old Robert Mugabe after the intervention of the military, is under pressure from opposition parties and the public to implement political reforms. Under Mugabe’s 37-year rule political space was limited, with the latter part of his reign marked by the emergence of a Zanu-PF faction aligned to his wife Grace that threatened to usurp the army’s central role in government. Chiwenga, who retired from the army on Monday, is the latest in a string of senior military figures appointed by Mnangagwa to important political posts. Presidential spokesman George Charamba said Chiwenga and Mohadi’s appointments as vice presidents of the country could only be made by the Chief Secretary to the Government and Cabinet, Misheck Sibanda, who is out of the country.